The Reape-Rickett Law Firm - Your 2019 Super Lawyers! The Reape-Rickett Law Firm is proud to announce Shareholders, James P. Reape, Esq. 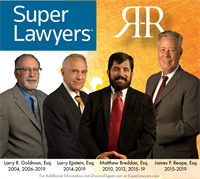 and Matthew A. Breddan, Esq., Senior Attorney Laurence R. Goldman, Esq., and Larry Epstein, Esq., Of Counsel, have once again been selected as Super Lawyers by Thompson Reuters. This year's selection is Mr. Reape's 5th year, Mr. Breddan's 7th year, Mr. Epstein's 8th consecutive year and the 15th year Mr. Goldman has received the Super Lawyer distinction! We are thrilled four members of The Reape-Rickett Law Firm have earned the distinction of being in the top 5% of Family Law Attorneys in Southern California in recognition of their years of experience and professionalism. This is a direct reflection of our Firm's mission of each member conducting themselves in accordance with the highest ethical standards and commitment to providing quality services. With offices in Valencia, Calabasas and Westlake Village, our attorneys look forward to continuing to advocate for clients across Los Angeles and Ventura Counties and providing family law legal services that are second to none. The 2019 Southern California Super Lawyers list represents attorneys who possess a high degree of peer recognition and professional achievement. Further, no more than five percent of the lawyers in California are selected by Super Lawyers' patented multiphase process that includes a statewide survey of lawyers, an independent research evaluation of candidates and peer reviews by practice area. For additional information or for help with family law matters contact The Reape-Rickett Law Firm at 888-851-1000 or visit DivorceDigest.com. To learn more about Super Lawyers, visit SuperLawyers.com.